I know, I know, it is that time of the year again... The funny turtle buns, eating stinky tofu, buying tooth-decaying candy from the stalls that are synonymous with the Nine Emperor Gods Festival, which will run from 1st Oct to 9th Oct 2016. In terms of blogging, this year I will do a slight change in the way I blog this festival. In this blog, I will post the usual events and daily happenings of the festival that I visit, whilst in Photo.Culture.Travelogue, the content will be more of a photo-blog. 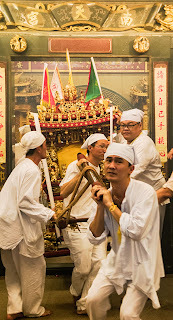 So to kick off the year's countdown, let me show you snippets of photos that I have posted as countdown for the Nine Emperor Gods Festival 2016. For more info on the happenings and schedule of the famous Ampang Nine Emperor Gods Festival, click on to Cheryl Hoffmann's site on Nine Emperor Gods Festival where she has meticulously listed down the daily events for Ampang Nan Tian Gong Nine Emperor Gods Temple. Don't forget also to take a look at her stunning and emotionally touching photos of this festival. Or you can click on this link Nine Emperor Gods Festival Countdown 2016 to view all of the post in the countdown series in the Photo.Culture.Travelogue blog.